Roker Canoe Club was founded in 2011 to primarily offer recreational opportunities in Canoeing and Kayaking Sports. It is important for anyone keen on canoeing / kayaking to be safe and competent when on the water, so the Roker Canoe Club is affiliated to the British Canoe Union. If you are keen to find out more please contact us, and we will be able to explain more about the club and how to get involved. Roker Canoe Club is a young and growing club with the aim of offering recreational opportunities for all ages in paddling sports. The Club is keen to welcome new members, whatever your level of experience. As a young club we are very much driven by the wishes of our members so why not join us and help move the club forward? If you are a qualified coach we would especially like to hear from you. 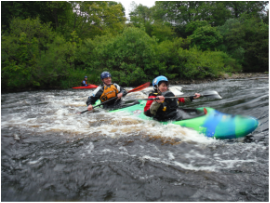 Members of the Club regularly paddle on local rivers such as the North and South Tyne, the Wear and the Tees. Sea kayaking and surfing are also popular, as well as the occasional touring trip. The Club has a shortage of qualified coaches, so we have launched a coaching programme to help people to become qualified. If you are interested please let us know. The club can support right through to Level 2 with MWE, which includes 4 Star, in both kayak and canoe. Members who are experienced paddlers organise regular trips. Take a look at the Forums to see what is going on. Paddling Plans in the Forums section is where you can see what is going on informally amongst members of the Club. There is something happening most weekends and during the lighter months through the week as well.